Valentine’s Day at CHOP restaurant. Romantic dinner for two. We’ve composed a Valentine’s Day menu that includes the very best from Chop: 100% Canadian beef, delicious seafood, and remarkable desserts. Choose a starter, entrée, and dessert for just $49 per person. Start your meal with a delicious soup or salad like the Creamy Seafood Chowder or Blue Cheese Wedge Salad. Choose from great entrées like Slow Baked Salmon and Oven Roasted Chicken, or try a steakhouse classic like Prime Rib, Teriyaki Top Sirloin, or the Blackened Sirloin Crab Cake Oscar - a 6oz top sirloin, topped with a house-made crab cake and bearnaise sauce. Finish it off with your choice of dessert: New York Cheesecake with Blackberry Compote or the Fallen Chocolate Soufflé Cake. We’ve carefully compiled a great list of special wines to pair with your Valentine’s Day meal, ask your server which one is right for your dinner selections and enjoy a glass or a bottle! 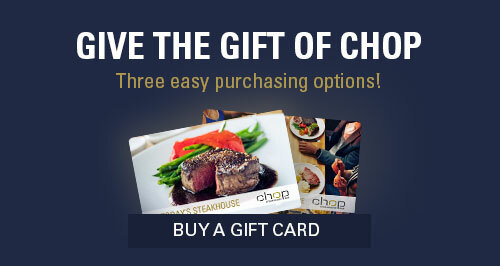 You can make Valentine’s Day reservations online or by calling your favourite Chop restaurant. Follow us on Facebook, Twitter and Instagram for all the latest Chop news.